The August Property Owners Meeting was jammed packed full of topics to discuss. Practically all of Beacon Court showed up about their parking tickets and that was heavily discussed – We will save that for a separate post. That was the bulk of the meeting – stay tuned. There is a Gerrittsen Beach Property Owners Meeting Wednesday and expect it to be HOT! Both topics and temperature! The parade kicked off at Gerritsen and Whitney Avenues led by the Vollies, VWF Color Guard, Gerritsen Beach Community Marching Band, Stars Dancing Center, GBPOA, and lots of Gerritsen Beach beach goers in tow. The parade ended at the Lois Avenue entrance of Kiddie Beach. 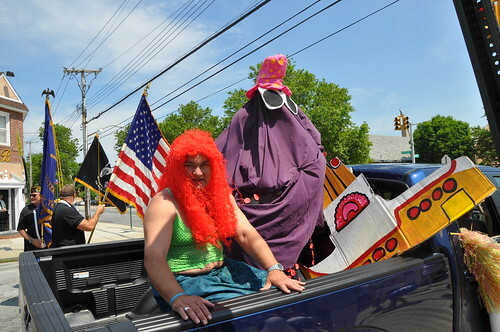 I would like to think that although we have many parades in Gerritsen Beach throughout the year, I consider this parade one of the best and that it is somewhat of a “sponge parade”. Meaning that although it it starts off with only few dozen people at the start by the time the parade hits Lois Avenue there are at least a few hundred people. 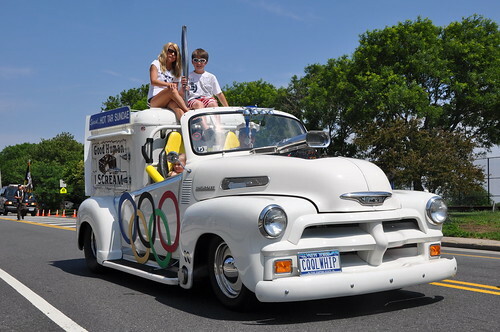 This years honoree was Gerritsen Beach resident Caitlin Sarubbi – who notably competed this year in the Vancouver 2010 Paralympic Games. Also Kiddie Beach dedicated the children playground to Liam James Walsh who suddenly and unexpectedly passed away a few years ago at the age of 6. Update: 5/8/2010 – 11am – Updated the reason of resignation of a board member. Generally speaking this was a quiet meeting. There was no votes, nothing of great significance, other than lots of great announcements, so lets recap what did happen. Kiddie Beach registration is here! Stop in at the Cort Club every Thursday in April and May Starting the April 15th from 7pm – 9pm. To join Kiddie Beach or the GBPOA you must live with in Gerristen Beach which is from Whitney Avenue and The Point. Although Anthony Weiner talked heavily about Health Care and Immigration reform at the last property owners meeting it’s a little out of our scope and we won’t touch on those larger topics. You can watch the whole video here. However there are some topics which you need to know about! Well, last night Anthony Weiner was at the sheepshead bay plumb beach civic meeting…more to come on that later. However, he will be at TONIGHTS property owners meeting. Be there! The Gerritsen Beach Property Owners March meeting nothing much happened. The meeting started a little after 7:30, was lightly attended (a few board members are hospitalized), and ended in under 20 minutes. Golden Gate fate by secret meeting by Markowitz, Guess who’s not invited?